It is 2016 and as with every new year, comes new promise. Already on the up side: Leonardo, in accepting his Golden Globe for Best Actor in The Revenant, has made fans and friends with all Indigenous people in North America. What a gifted, insightful and good person he has proven to be. On the down side: David Bowie died of cancer yesterday at the age of 69. There isn't a family who has not felt the pain of that terrible disease...and now, our world music family mourns. As for me, I am gearing up for an exciting year in which I hope to share learnings, make new friends and grow as a person. I have two or three books in the making; Reading Red, Proud to be Métis and The Journal of Etienne Mercier... And I am involved in several exciting projects with Rubicon...books/series that should support and serve indigenous people. I hope to meet many of you this year, new and old friends. I wish you health and happiness - you and your loved ones. I am thinking nothing but positive thoughts for our new governments...and for those of our American neighbours. Good luck - Bonne chance! A bientot! My agent Chris Patrick's job is to put me in touch with the right people. His job is to help me spread hope and teach the learnings that will allow our youth to tackle the world we have saddled them with. This morning, Chris sent out the following letter. If your board or school community is looking for hope and/or direction, please give Chris a call. He is open and accommodating and has been responsible for many successes in my work. It is so very exciting and appropriate that BC Ministry of Education has put such a strong focus on First Nations issues in the professional development mandate. I have the honour of working with David Bouchard, Canada’s renowned Métis author and champion for literacy at all levels. With this new focus comes one notable and significant shift: The importance of aboriginal learning. 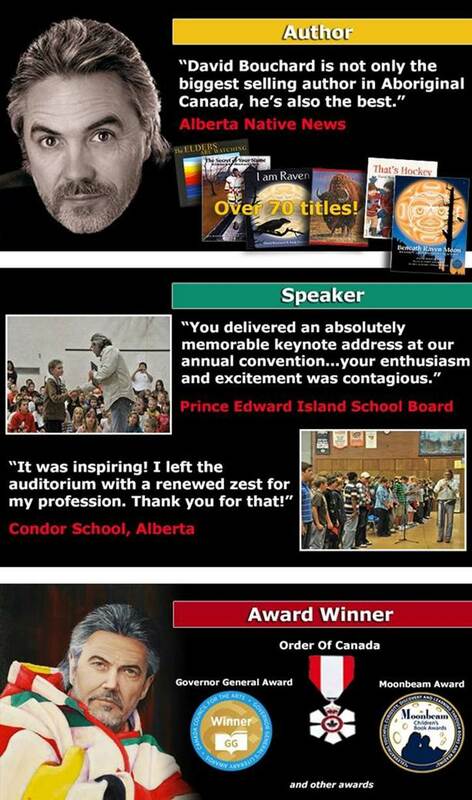 David Bouchard is Canada’s best-selling Aboriginal author and is a notable and recognized expert in reading. In his upcoming, new book, Reading Red, A Métis Story for and about Aboriginal Readers, readers and their potential role models come to understand why it is imperative we all become readers. They come to understand what they have to do to become readers and the benefits of doing so. David reaches out to Métis, Inuit and First Nation Elders, parents, educators, students, and youth as well as all who have a vested interest in First Nations, Inuit, and Métis children. In Reading Red: A Métis Story for and about Aboriginal Readers, he offers strategies that community members, parents, and educators can use to guide their youth toward becoming lifelong readers. David has a formidable list of books for readers of all ages, books in 13 Aboriginal languages. His writings speak to culture, tradition and values of Canada’s Aboriginal people. He has partnered with Canada’s very best visual artist and musicians. His approach to reading and writing is his own. He has cut a new path that is sure to be followed by writers in years to come – a path for people whose cultures and styles of learning are special and unique. Through stories, flutes and life learnings, David Bouchard touches the lives of students, parents and educators in all matters that affect Aboriginal interests. David presents to conferences, teachers, parents and students. His presentations have earned him Nation-wide recognition and he has been awarded the Order for Canada for his contribution. 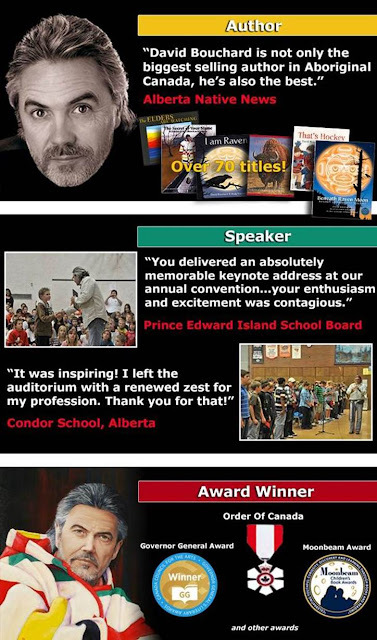 I invite you to learn more about David at his website (www.DavidBouchard.com) and encourage you to have David visit the teachers, parents and students of your district. Please call me if you have any further questions.